See the picture on the right? Looks good, doesn’t it? I made that bread this weekend. It required very, very little effort on my part. And, it cost less than 50 cents to make. Yes, you read that right…this frugal bread recipe requires no kneading. Seriously. When I say this is easy to make, I really really mean it. 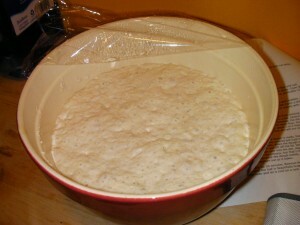 I first stumbled onto this great bread recipe on Mother Earth News. 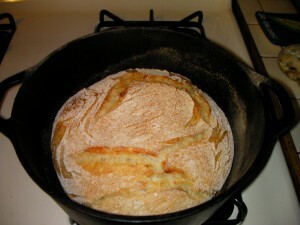 I was immediately intrigued because a) I’m addicted to crusty bread, b) this recipe uses a Dutch Oven to bake the bread and c) it looked really easy. So, I decided to give it a go this weekend. And boy, was I a happy girl. This simple bread recipe has a lot going for it. It only uses flour, salt, yeast, and water. So, you’re going to save a bundle by making this at home instead of buying artesian loafs at the grocery store. It’s tasty. The flavor is on the yeasty side, which I love. It’s the easiest bread recipe I’ve ever seen. 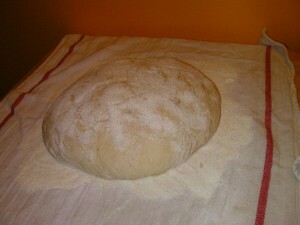 You really don’t have to knead it, and still you get the beautiful bread shown in the picture. Is there a downside to this recipe? Yes. And the downside is turnaround time. This recipe takes a long time to make. But, don’t think this means you do a lot of work. You don’t. I worked with a bit more and threw it in the oven- bread was done at 12:00 p.m. So, that’s a turnaround time of 19 hours. But, 98% of that time is just letting the yeast do its work. So, this is not a recipe to use when you have people coming over in a few hours. Clean up was minimal for this bread recipe. Yahoo! 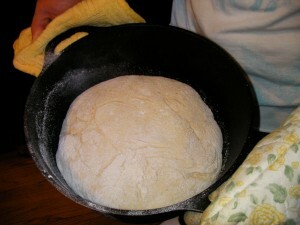 The bread slid right out of the Dutch Oven when it was done, and all I had to do was dust out the excess cornmeal. Again, you find this original recipe at Mother Earth News. Slice of bread with wine and cheese, anyone? I’m all over this. Been looking for a good bread recipe. looks great. I got a free breadmaker from freecycle and use it every other day. 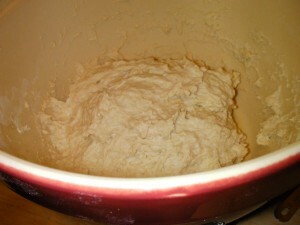 It makes great bread and dough as well. This looks amazing! Yum, yum, yum! 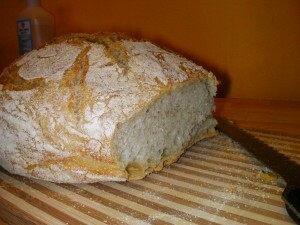 Logan and I were making a lot of bread during winter (and grinding our own wheat too). But we stopped because of the heat. It has been unreasonable hot in Sacramento – I hope it cools down this weekend because I want to try this recipe. Thanks for sharing. @GreenBean- Thanks so much for reading! I hope you enjoy it. @Rebecca- That’s so cool you got a free breadmaker! I would love to have one of those. But now that I’ve found this recipe I’ll just use this one all the time. I think next time I’m going to try it with whole wheat flour. This was some of the best bread I have ever had! It was super easy to make. I let it set on the inital rise for 17 hour or so. When it came time to let it rise a second time, that rise ended up being closer to 3 hours instead of 2, but it was still wonderful! I am going to play with this recipe more, seeing if cheeses, herbs or whole wheat flour can be used to the same awesome effect. Thank you for this recipe! I will be making this quite often and for anyone that I can! the only downside I personally found was I had no way of baking the bread the way it was recommended (in a covered, oven-proof dish/pot), so I spend 36+ dollars to get a cast iron dutch oven. 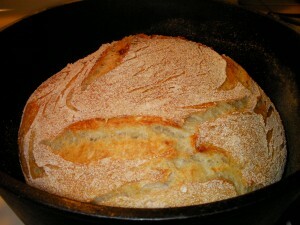 However, I just know I’ll use the dutch oven for this bread again and again and again as well as other recipes. I would have loved to have not had to buy a somewhat pricey pot, but the taste of this bread made it worth it.